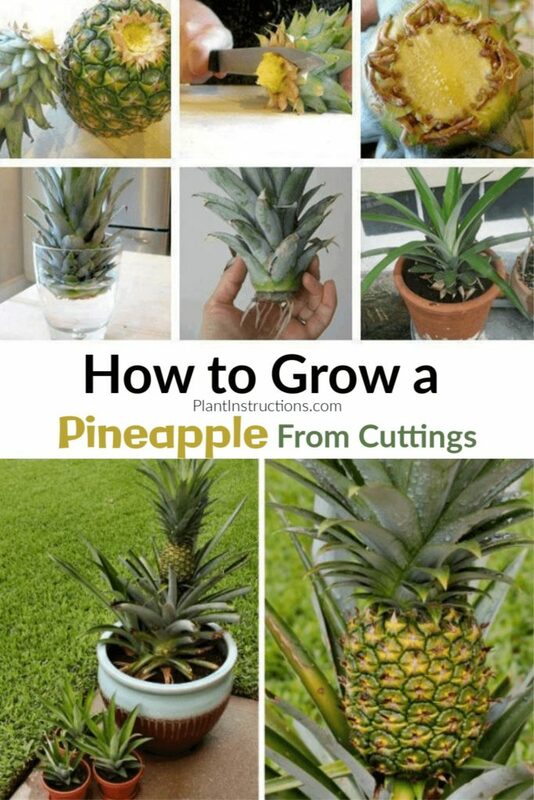 Looking to learn how to grow a pineapple? You’ve come to the right place! The pineapple (Ananas comosus) is a tropical plant that is part of the Bromeliaceae family and can be grown in a number of different climates, with a tropical or subtropical climate being favored. 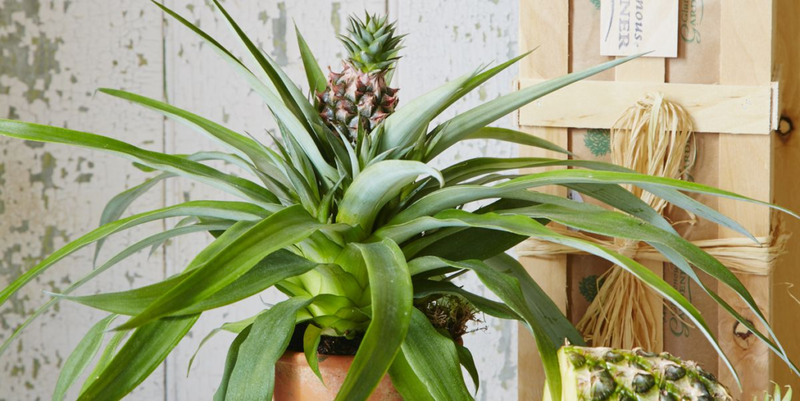 But do you know how to grow a pineapple in your home or garden? We’ll show you how! Pineapples are actually fairly easy to grow, and all you really need is just the top part of the pineapple (the crown) and some water! While this may not necessarily guarantee the actual fruit, it can guarantee a beautiful tropical plant in your home! As a result, pineapple plants make for very popular houseplants and are fun project for the entire family! These tropical fruits have been grown for thousands of years, and for good reason too! The pineapple is a sweet fruit that is consumed by numerous cultures not only for its delicious taste, but also for its health benefits. Pineapples are packed full of healthy enzymes which can aid in digestion, vitamin C which can help reduce the risk muscle degeneration, and antioxidants which help support a healthy immune system. Keep reading to learn how to grow a pineapple in your home or garden! In this tutorial, we’ll show you how to grow a pineapple by cutting off the crown and re-growing it in water, and then in soil. Above all, growing a pineapple this way is a really easy way to ensure good, adequate growth. Start off by choosing a good, healthy pineapple, and one that’s preferably organic. Organic pineapples ensure that they are not laden with pesticides, therefore providing you and your family with a healthier option. Cut off the pineapple top (crown) using a sharp knife. Remove any extra leaves that may be near the bottom of the cut, and ensure that the cut is a clean one. Ideally, there should be no extra fruit left, as this can cause rotting. Fill a small container with water and place your pineapple top in the water, cut side down. Be sure that the water does not touch the leaves. Check the water every 2-3 days and replace as needed. Your pineapple plant will grow faster if placed in a sunny, south facing window. Depending on the temperature, amount of sunlight, and humidity, the pineapple will start forming roots within 1-3 weeks. Once that happens, you may transplant the pineapple in soil! Remove the rooted pineapple from water and transplant into a large pot or container that’s filled with moisture retaining soil. If you live in a tropical or subtropical climate, you may plant the pineapple directly outdoors. Add soil around the roots, making sure they’re completely submerged in soil and tamp down with your hands. Water your pineapple plant immediately after planting and then water regularly thereafter. For quick growth, be sure to check the soil on a regular basis. The soil should always be a little moist. Pineapples grow big and healthy when they are in direct sunlight, so place your potted pineapple in an area where it will receive 4-6 hours of sunlight per day. It will take about 1-3 months for the pineapple plant to firmly take root into the pot. You can test this by gently pulling onto the pineapple plant. If it’s firmly rooted, you’ll know! Once the plant has firmly rooted, it will start growing bigger and you will then need to re-pot it. Do this by gently taking the plant out and re-potting it into a 10-12″ pot. Use a rich, but fast draining potting soil mix. After about a year, you’ll need to re-pot the pineapple plant yet again, into a bigger, 5 gallon pot or container. Fertilize the pineapple plant once a month and no more. 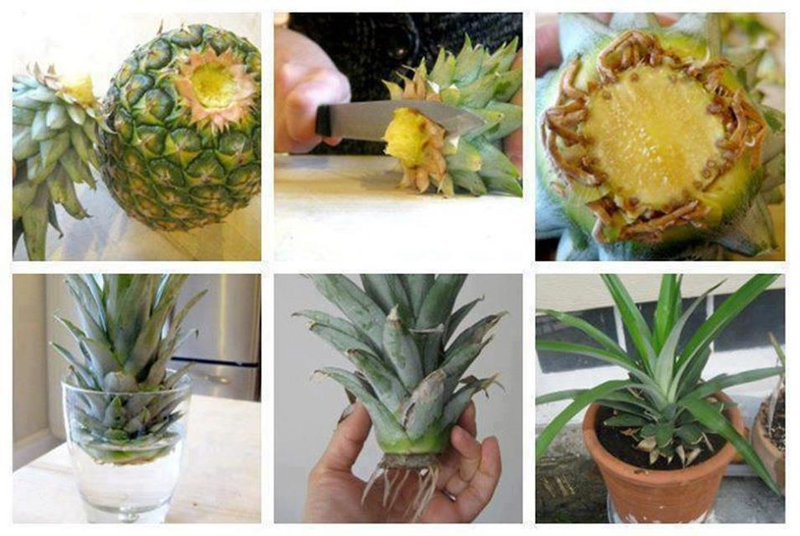 Do this only once your pineapple plant has become established: over-fertilizing it can be a sure way to kill it! Use an organic, balanced fertilizer at regular strength. If there’s one thing you must have with a pineapple plant, it’s patience! It can take anywhere from 2-3 years for a pineapple plant to bloom or produce fruit. This is all depended on a few factors such as climate, sunlight, soil quality, humidity, and USDA zone, just to name a few. If you see your pineapple plant producing flowers, that means it’s almost ready to produce the fruit! Once you see flowers, it will take a few months for the plant to produce the actual fruit! Pick the pineapple when the color is an even gold yellow. Once you’ve picked off your pineapple, you can cut the crown off and start the process all over again! It may take some time and a lot of patience, but as every good gardener knows, it’s worth the wait! But what if you’ve followed all the instructions and you still don’t have an actual pineapple fruit? Unfortunately, not all pineapple plants will produce fruit and this is largely in part due to your climate. If you live in a non-tropical zone, the truth is that the pineapple plant may not be getting enough warmth and sunlight during its growing season. It is after all, a tropical plant! In conclusion, a pineapple plant can look very modern and stylish in any home, giving your space a much needed tropical vibe! 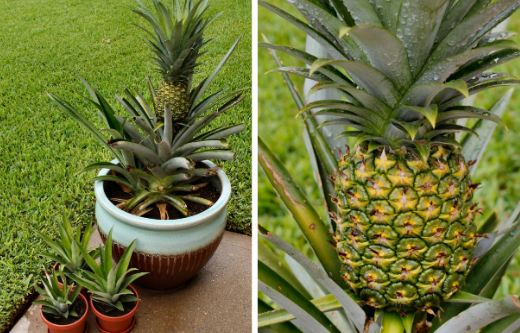 How to Grow A Pineapple In Your Home or Garden was last modified: April 15th, 2019 by Aniela M.
PreviousRaven ZZ Plant: The New, Stylish Plant You Need!